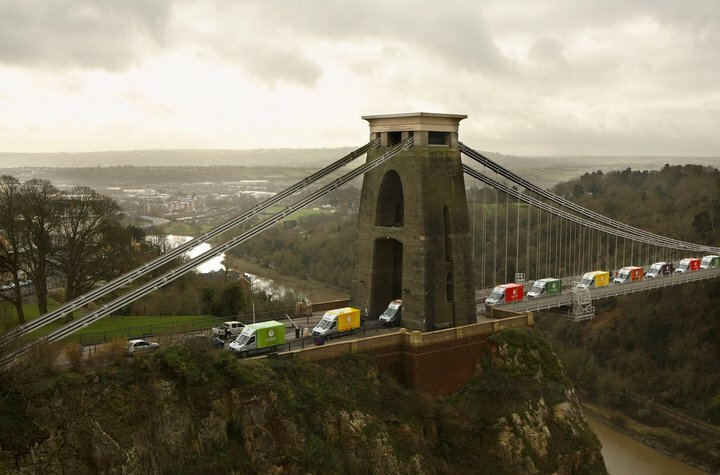 Good news for food-loving Bristolians: as of the start of March, online supermarket Ocado are now offering deliveries within Bristol. The company, best known for their partnership with Waitrose, offer a range of branded and Waitrose products, along with their own range of Ocado-branded items, developed to provide customers with quality products at reasonable prices. At 6pm on the dot on the delivery day, my doorbell rang and Ray introduced himself as my Ocado delivery driver, before promptly apologising for being early. Early?! Perfect timing – I’d booked the 6-8pm slot! I’ve used the online delivery services of other supermarkets in the past and had issues with deliveries being much later than they were booked for – even to the extent of being rescheduled for another day, which isn’t ideal when you’re relying on that delivery for your dinner. Ray was friendly and chatty, and even offered to take my groceries right to the kitchen – service that I had from Ocado in London, but never from other supermarkets. The receipt you get with your order is far better too: items are listed according to where they’re stored (fridge/freezer/cupboard), and the carrier bags in which they are delivered are sorted and colour-coordinated too. Best before dates are also brought to the fore, with my receipt telling me which items needed to be used within a week (and on which day) and which lasted longer. My only issue was that the bottle of anti bacterial surface cleaner had leaked over the inside of the bag. I didn’t spot this until after the driver had left, and I didn’t complain – it was a trial, after all. However, as the product was packed with similar products (hand cream and washing up liquid) it wasn’t a major issue. When I used to use Ocado in London, they didn’t have their own branded products – the range was only launched in September 2010. It’s quite a range, though, including dairy products, fruit and veg, canned goods, bakery and deli items, with products priced in line with Tesco and Sainsbury’s. My delivery included Ocado-branded fruit, salad, bread, cheese and cold meats, all of which I’ve been impressed with. The real test will be the coffee, which I haven’t broken into yet. Definitely happy with the trial delivery, and I’ll be booking a “real” order in soon. I tend to use Waitrose for the harder-to-find ingredients for recipes, where the likes of Sainsbury’s fall short, but they can be expensive for basic items. With the Ocado-branded range now included, it makes it far more likely that I’ll use the service as a regular customer, rather than just popping to Waitrose for odd bits and pieces and doing my main shop elsewhere. Note: I was one of a selection of media agencies and bloggers receiving a free trial delivery from Ocado, totalling around £30.